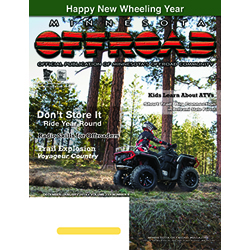 Offroad Featured Article Archives - Midwest Sports Publishing Network, Inc. 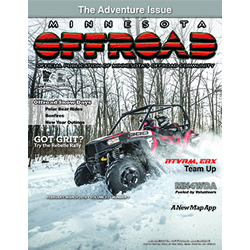 The Parks & Trails Division of the Minnesota DNR is looking at the possibility of expanding camping opportunities for campers with off-highway vehicles (OHVs) in northwestern Minnesota, specifically the Beltrami Island State Forest and Hayes Lake State Park area. Please note: this proposal is NOT intended to bring OHVs into large, popular State Parks. Please take a few minutes and fill out a DNR survey. This isn’t a voting issue but a demand issue. If there isn’t a demonstrated demand by OHV owners, then the DNR will not provide the facilities. The DNR held two public meeting on this issue last week, one in Warroad and the other in St. Paul. I attended the one in St. Paul. The meeting was poorly attended. I had anticipated a packed house because we know the Parks and Trail Council, a private, non-profit group that lobbies the State Legislature and works closely with DNR Parks and Trails Division, is very against letting ATVs or OHVs operate within a State Park, even one as underutilized as Hayes Lake State Park. They are telling their members to vote early and often against this issue, as the current on-line survey does not limit the number of times you can fill out the survey. Parks and Trails Council is pushing hard to defeat this issue, as you can see on their home page, at https://www.parksandtrails.org/ . DNR said at the meeting on Thursday they have received about 400 surveys already, and the comment period doesn’t close until December 27th. Here are some key supporting messages that you can choose from to cut and paste into the comment section on your survey, if you wish. 1. The State of Minnesota and the Minnesota Department of Natural Resources is investing considerable resources into getting more residents outside and participate in outdoor activities. Off-Highway Vehicle use continues to be one of the fastest growing activities. 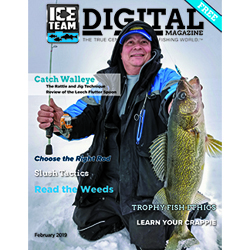 It is time that the Minnesota DNR, Parks and Trails Division start providing for this growing outdoor activity. Hayes Lake State Park is a perfect example of an under-utilized Park that could easily accommodate the added use and could be done in such a way as to not impact the current park users who don’t use OHVs as part of their outdoor experience. 2. Within ATVs, the Class 2 or Side-by-Sides are the fastest-growing segment. It is largely made up of families and retired folks. 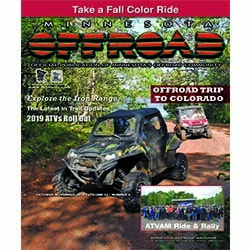 The retired ATV riders are not looking to camp in a tent, but have RVs or Campers, and are looking for full hook-ups. They often stay at a campground for several days, if they can ride from their site, making it their base camp as they enjoy the surrounding trail systems. These folks often have over $100,000 invested in their RV, or camper and tow rig. They don’t like to leave them parked in a remote State Forest without any security. They appreciate the security provided at State Parks and also appreciate the quiet time after 10:00 p.m.
3. At Hayes Lake State Park, Site 3 would make an excellent campground for OHV campers. The park has an existing road to this site, so it would not require a major investment to access it. An electric line is just over half a mile away, and could probably be routed along the existing road. It appears that a trail access for OHVs could be constructed to the north, less than a 1,000 feet long, and the trail would be out of the Park and in Beltrami State Forest. There would be no OHV traffic back through the Park, past the other campers or day use visitors. 4. It makes much more sense to provide OHV camping at Hayes Lake than to develop something at Bemis Hills, where you would have to extend power several miles, improve the well and develop a new septic system. Plus, Bemis Hills doesn’t have security on site. Also, by providing full-hookup camping at Bemis Hills, you would displace many of the people who are camping there now. They are camping there because it provides the more rustic type of camping they are looking for; they don’t want full hookups or a shower building and the structure that goes with those type of improvements. 5. To legislatively create a State Recreation Area within Hayes Lake State Park at Site 3, could require as little as 80 acres, to provide the camping, and shower facilities as well as the trail access to Beltrami State Forest. It seems like a very reasonable and workable solution. This would have little or no impact on the current Park facilities and provide better utilization of existing facilities and the developed part of the Park. It would help meet the Department’s goal of getting more people outdoors while still protecting the sensitive resources within this Park. If you have any questions please let me know, or contact the ATVAM Executive Board or your Regional Directors. Thank you in advance for your time and effort on this important issue. Please take the survey today. Remember, surveys must be in by December 27th! Please also forward this Action Alert, and encourage everyone in your ATV club, Facebook group, and friends and family who ride, to take the survey.